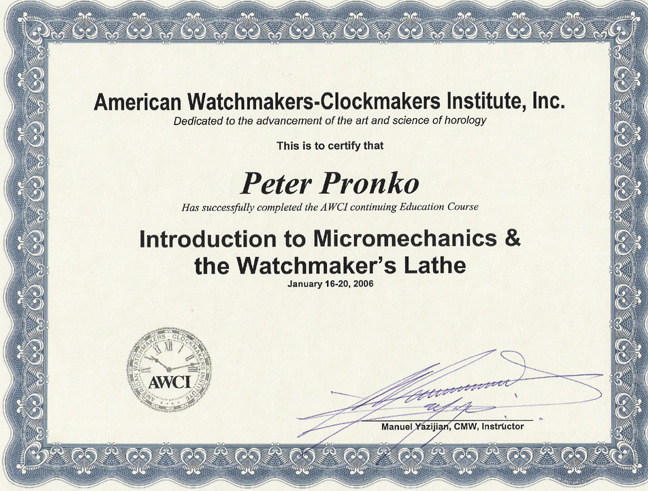 We are a second generation watch repair service providing high-quality work on name brand and specialty watches. Angelus, A.Shield, Benrus, Borel, Breitling, Bulova, Caravelle, Citizen, Elgin, ESA, ETA, Font, Gruen, Hamilton, Helbros, Helvetia, Howard, Illinois, LeCoultre, Lemania, Longines, Mallard, Meylan, Miyota, Moeris, Omega, Rolex, Ronda, Seiko, Tiffany, Tissot, Valjoux, Waltham, Wittnauer, and others. 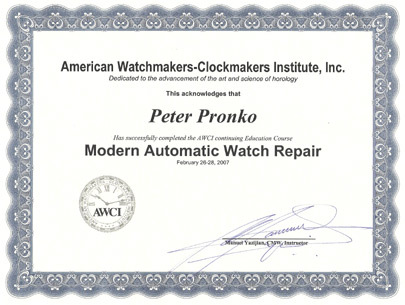 It will be necessary for us to examine your watch in order to provide an accurate quote for work to be done. However, for your convenience typical rates are shown below. 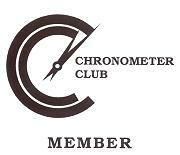 Standard manual wind $225; Manual wind with calendar $275; Auto-wind $300; Auto-wind with calendar $350; Chronographs by quotation. All pocket watches are $250. Mechanical watches are completely disassembled when serviced and cleaned in an RM90 Elma watch-parts basket type cleaning system. 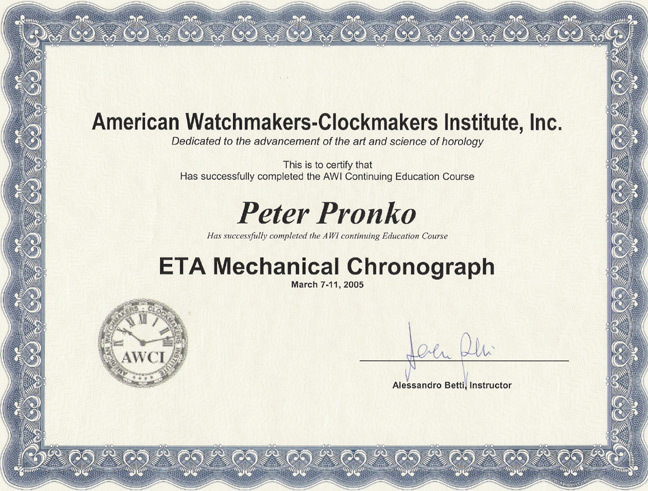 Final timing is done with an Elma electronic watch-timer. Computerized tests are performed on rate, beat error, and balance amplitude during the timing process. All work performed is guaranteed for one year excluding user inflicted damage and non-related parts failures. Due to their cost and complexity, high end watches such as Rolex, Breitling, Omega, and others require special pricing. Contact us for quotes on these type watches. 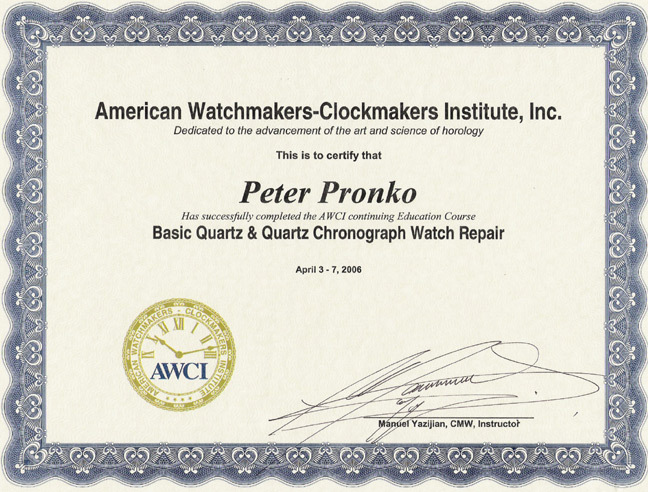 Many quality quartz watches (battery operated) can be dis-assembled and repaired in a fashion similar to mechanical watches. This includes CoA (clean, oil, adjust) and parts replacement. We are trained and experienced in doing this type of work.